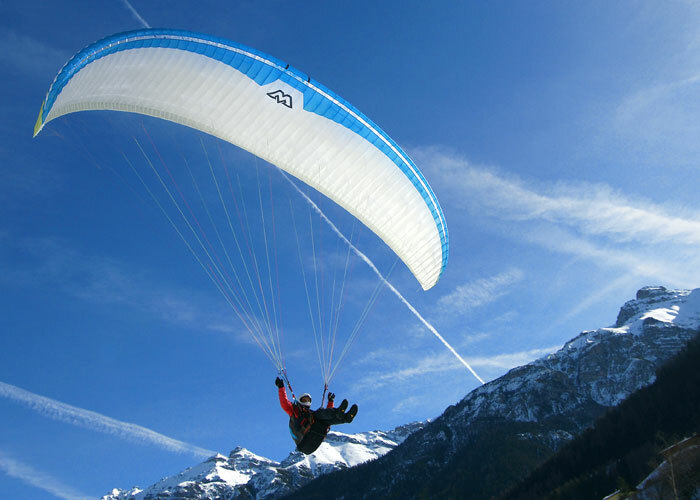 You probably have a few years paragliding and enjoy a glider with advanced features to continue to master your skills. The new MAC PARA Elan delivers stability and state of the art performance for seasoned pilots that demand more from their wing. It has has been designed to boost your confidence while still being able to strive to the top of the pack. With the Elan you can “Fly your best”. At MAC PARA we think of it as bragging rights to setting personal bests. 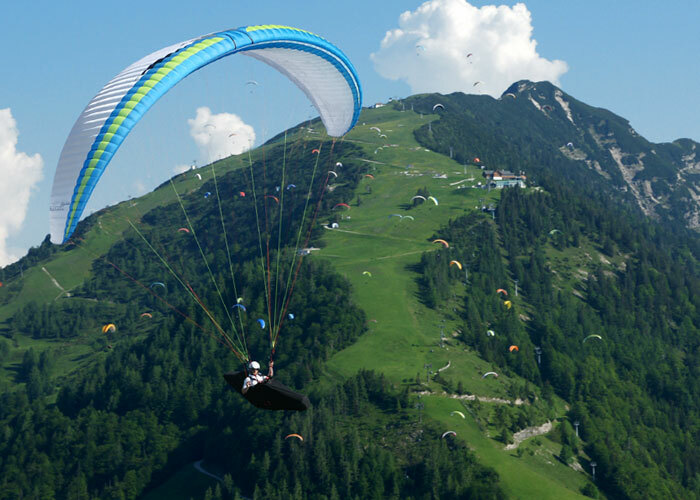 In addition to joining our existing line of MAC PARA paragliders, the Elan has extraordinary handling that is second to none. Its agility in XC tasks will satisfy the most demanding pilots. 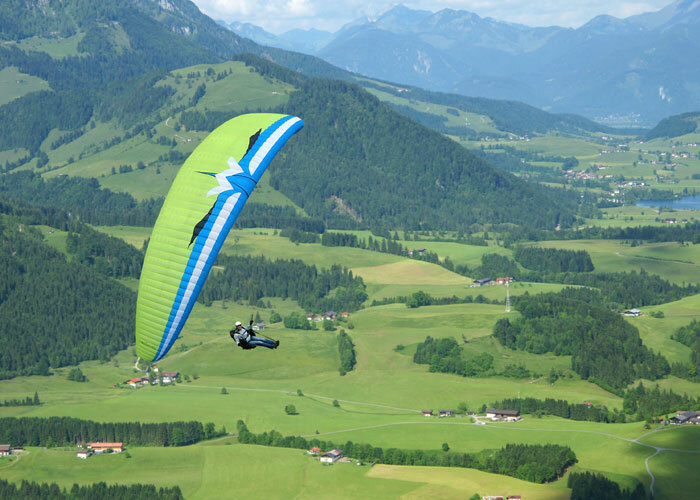 Be prepared to log outstanding and memorable cross country flights with its exceptional glide ratio. 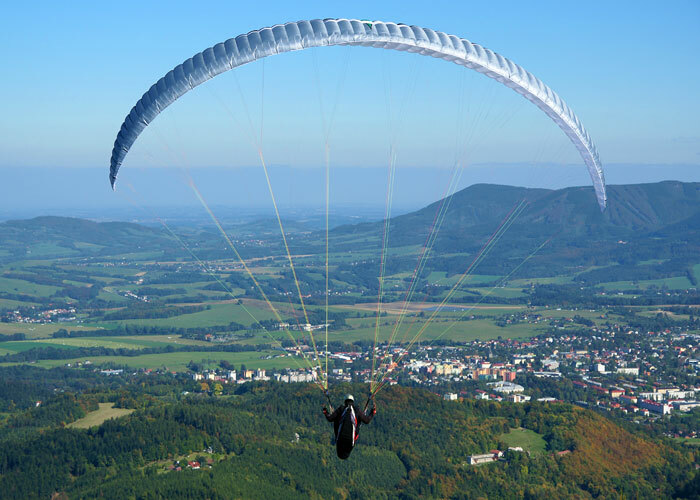 The Elan is the perfect paraglider for experienced pilots who crave an extra boost of performance and want to get more connected to their free flying spirit. 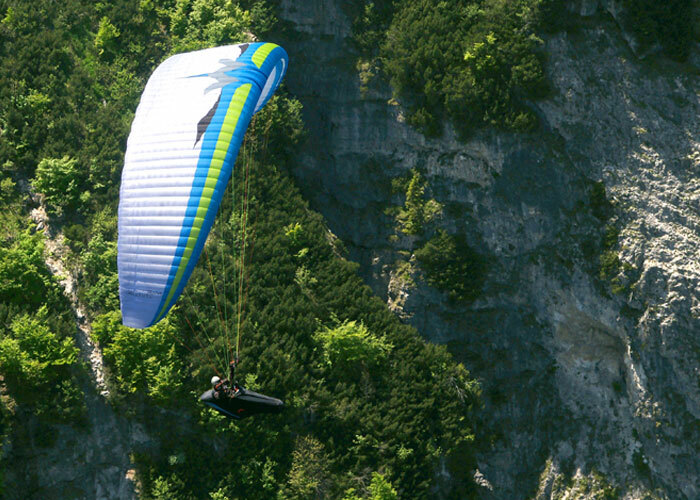 Choose this year to soar epic adventures with an awesome glider like the Elan. 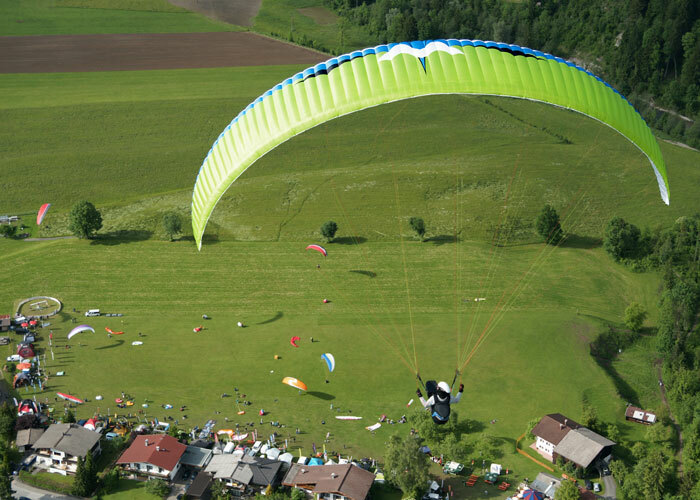 It has been designed with one goal in mind, to get you addicted to each and every XC flight. 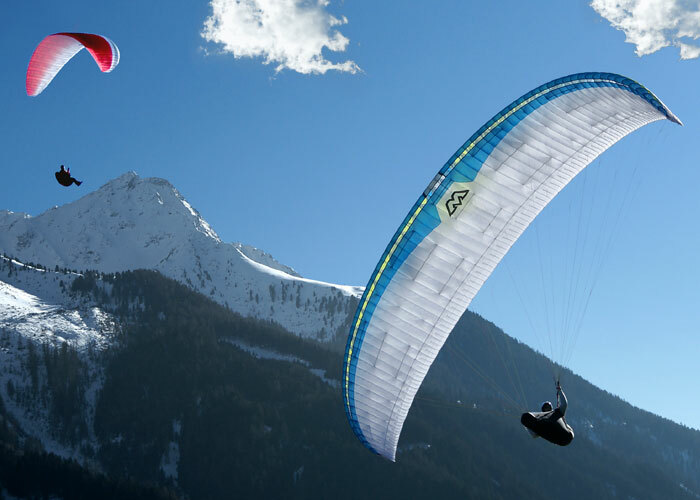 The performance increase and flight comforts of the latest “Eden” series paragliders has grown in unexpected popularity. MAC PARA designer Petr Recek was faced with the challenge to stretch his limits while still keeping it safe. He’s transformed all the Eden 5 features to give birth to a new design called the Elan. It’s designed for the next class, higher category and dedicated veteran pilot. After hours of modifications and tweaking, the patience has paid off. 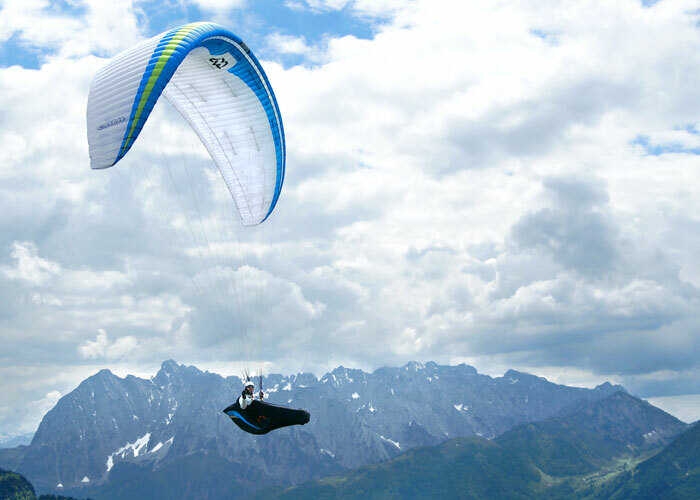 Increased performance features and a very good glide ratio across the whole speed range are both noticeable and favorable accomplishments. Petr’s goal was achieved! 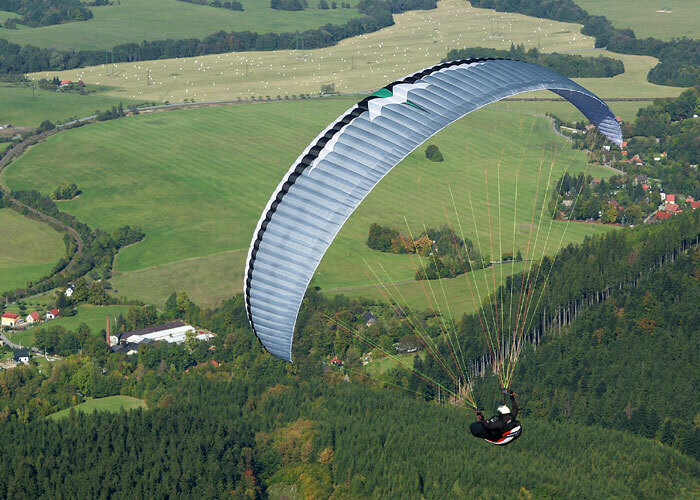 Finally, the Elan is a glider with sporty handling and impressive climbing performance to allow you to fly your best and forget the rest. During eight months of exhausting redesigning, the MAC PARA team tested and compared many different prototypes. These are newly designed “SharkNose” airfoils, 3D shaping, miniribs, etc. These new advancements paired with different systems of line geometry went through rigorous skepticism. A too sensitive (nervous) canopy, average performance or a light lack of climb performance resulted in the termination of the prototype. 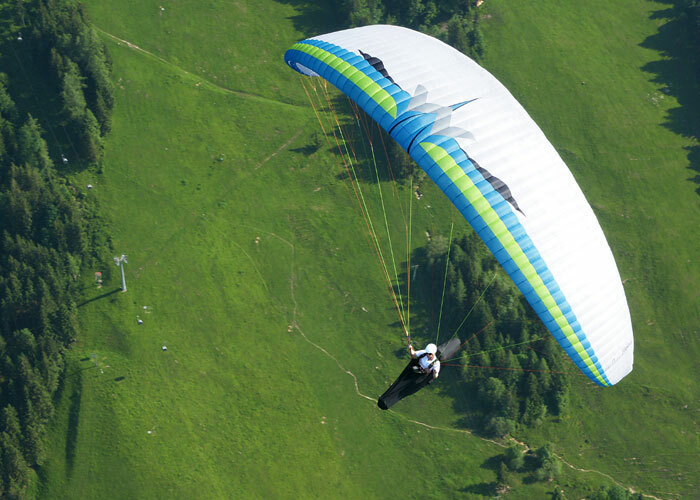 You will be pleased that the final product called the Elan is an exceptional glider with super clean surface. It has excellent performance feel and a wide speed range. It also provides incredible flight comfort and good stability. Intensive testing went into the development of the handling characteristics of the Elan. 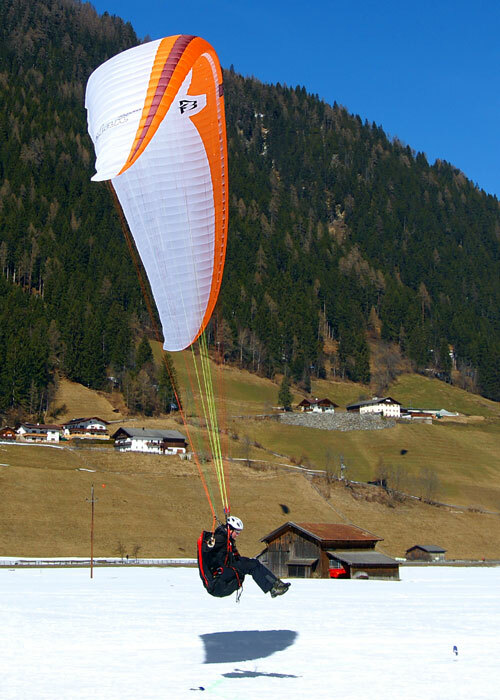 The result is a well-balanced glider with simple take-off’s and manageable behavior during extreme maneuvers. The Elan has an aspect ratio of 6.18 and weighs only 5.65 kg for the medium size. It is positioned well in the EN C category with an impressive 62 cells. This is incredible with its total weight being so low. The newly designed airfoils (the distinctive shark-nose) delivers exceptional glide, inflight stability and launch advantages. Their smooth shape is maintained by reinforced Mylar support panels combined with nylon “C rod” technology. The external result is a sporty silhouette with an elliptical form. 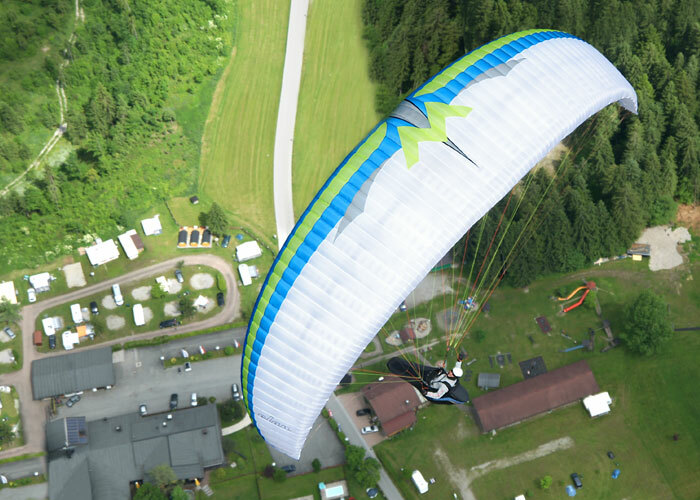 The unique shape of the leading edge makes the Elan faster to inflate. This new airfoil design also increases the gliders internal pressure resulting in easier launches. 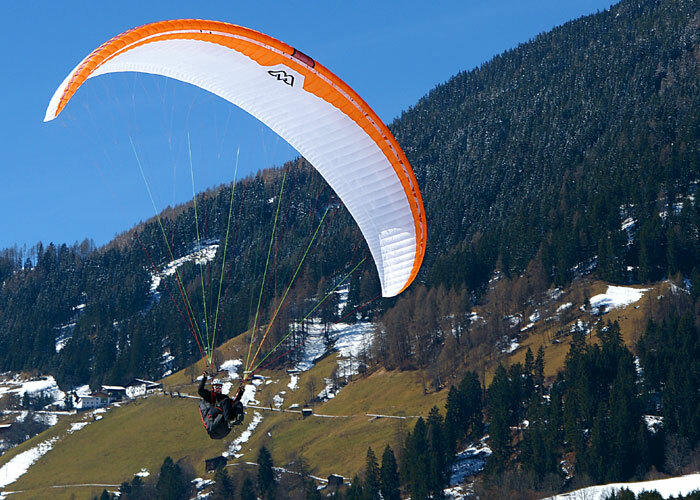 In turbulence the Elan maintains exceptional stability and resistance to collapses. This will require minimal inputs with your brakes or correction via the C risers by accelerated flight. The top lines are made from thin unsheathed Cousin Vectran competition lines to achieve incredible glide. The bottom lines are assembled with sheathed Edelrid Kevlar lines. The selection of line materials are a result of years of experience and a proven history choosing different types of lines. Be glad to know that the Elan will have the best longevity without the need for constant geometry correction or the need of full line set replacement. It also features thin risers with high quality HARKEN ball bearing pulleys. A loop on C strap aids for stabilizing the wing during accelerated flight. The risers have standard split “A’s” to facilitate easy Big Ears and the positioning of the outermost “A” line makes regaining level flight easy. You will find the opening is smooth and predictable and can be assisted by some brake input. 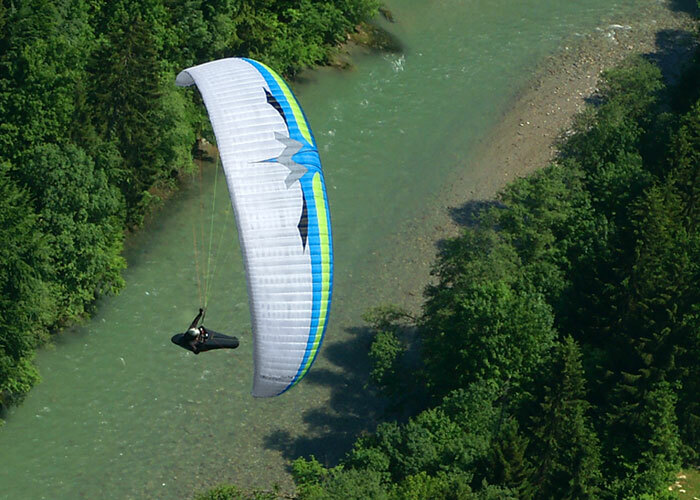 3D shaping offers not only new color design on the canopy but increased aerodynamic smoothness. Special miniribs on the trailing edge, higher arc, new design of the stabilizer all help to reduce the drag and increase the performance of the Elan. 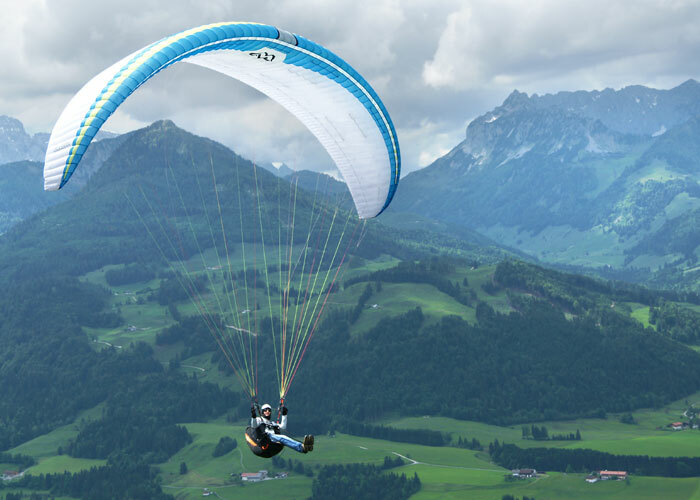 Rigidity of the canopy together with reinforced diagonals, line geometry and impeccable craftsmanship has been optimized for enjoyable flight comfort. The unique bunching design on the trailing edge is the secret to precise handling with outstanding climbing performance. MAC PARA has used this style on gliders for 20 years. The moderate brake pressure allows pleasant turns. Pressure increases progressively toward the end of brake travel to offer safety reserves. The Elan is equipped with brake handles with a swivel and easy to use snap buttons. Convenient self-cleaning exit “holes” on the wing tips will help remove any sand, grass or small stones from the glider. With the performance benefits of thin risers, reinforced shark nose leading edge, thin lines and high aspect ratio, the Elan appeals to both competent cross-country and serial class competition pilots. 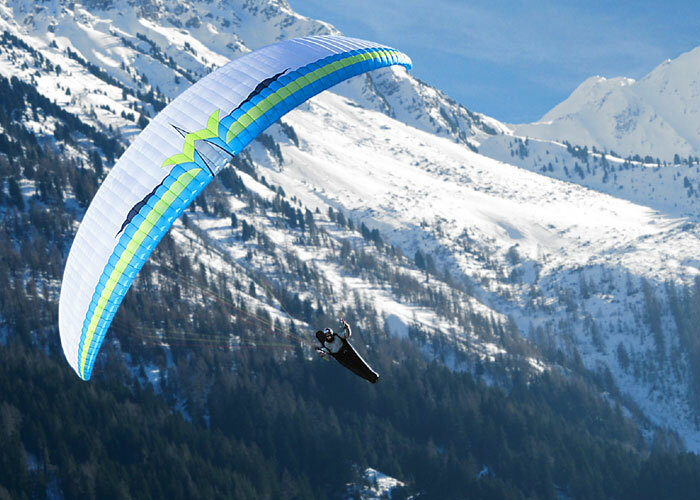 The exceptional glide ratio combined with agile sporty handling makes the Elan a real joy to fly. 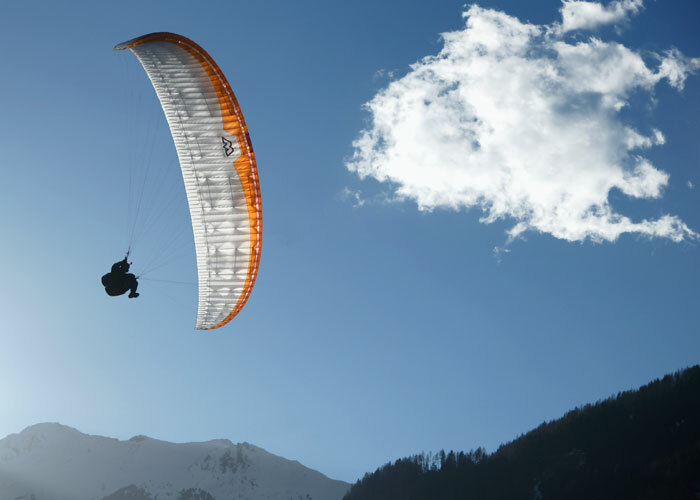 Contact your local MAC PARA dealer to purchase the Elan before the flying season starts. 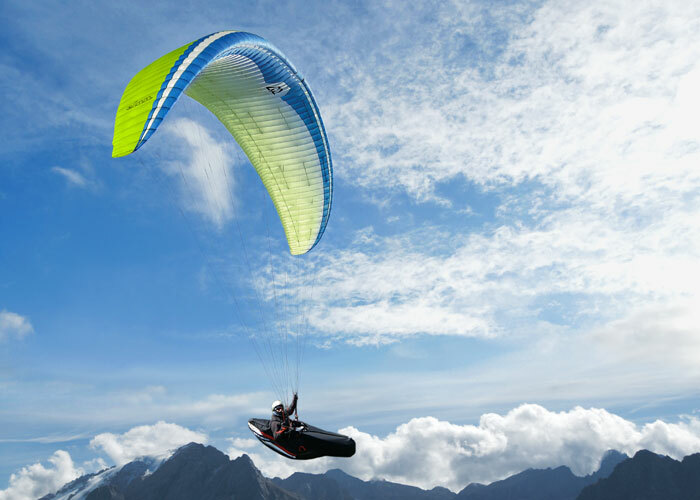 You will love the new design and handling of this flying masterpiece. Another great addition to the MAC PARA line up. ’At last, a real EN-C wing!’ Alpine guide Kelly Farina said on the Elan’s release. 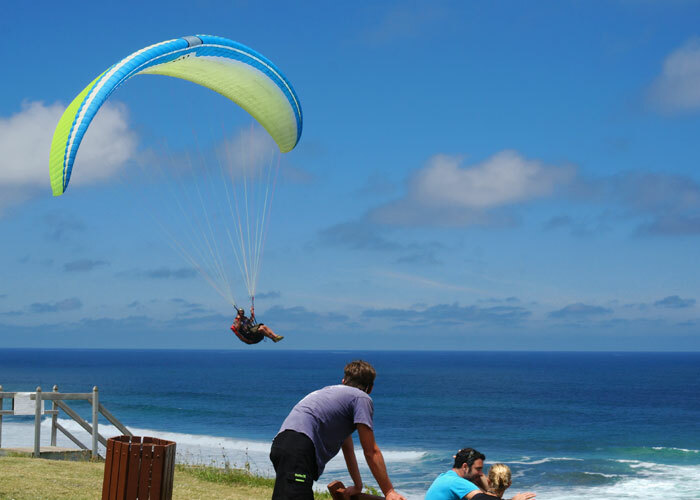 Mac Para say it’s, “The new relaxing way to enjoy paragliding.” Marcus King finds out for himself. I reviewed the EN-B Eden 5 last winter and enjoyed its dynamic direct handling and secure, forgiving nature. After the review I chatted to designer Petr Recek, who told me, “If you liked the Eden’s handling you’re going to love the new EN C we’re working on.” At that point there were just some early protos but no wings for test flights but my interest was piqued and I couldn’t wait to try it out when I got the chance. 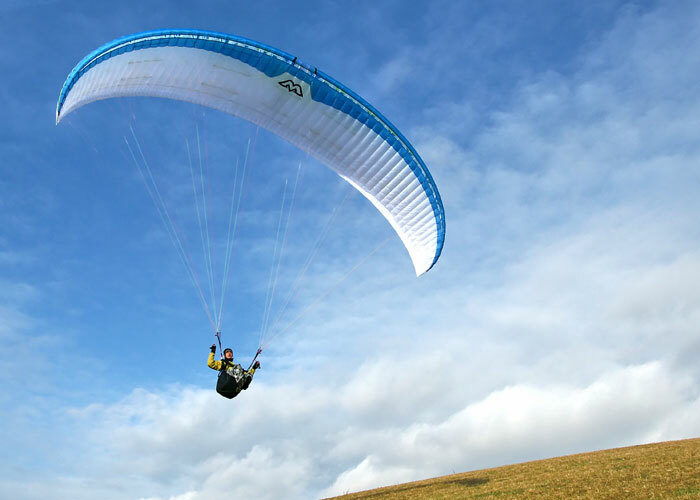 I was chomping at the bit to get in the air when the Elan arrived, so took it out on a less than perfect day at Gréolières, my local mountain launch in the south of France. The day was rather overcast but with a good breeze on take-off. I’ve always admired Mac Para’s way of keeping their wings looking relatively simple but clean to maximise performance. They’re an established brand that have held world records and been at the top of the competition circuit in the past. The wing comes packed in Mac Para’s concertina bag, which features a large foam- protected pocket for the sharknose leading edge - an early clue that there’s a lot of plastic leading edge in the leading edge. The Elan has a swept-back planform with a nearly straight trailing edge. Aspect ratio is a fairly conservative 6.18 with 62 cells. You’ll find mini-ribs on the trailing edge, which improve the shaping of this important part of the profile, and 38g/m2 Skytex material is used throughout. Clipped in and ready to go, a light pull on the three A-lines sees the Elan rise steadily overhead taking very little piloting on the ground. In fact in all wind conditions, I noted the same easy behaviour: calm and steady. Even a light and fickle wind on the mat above Monaco gave the Elan no problems. In the air the wing has nicely responsive brakes without overly long travel, and the wing banks up nicely as you pull down. 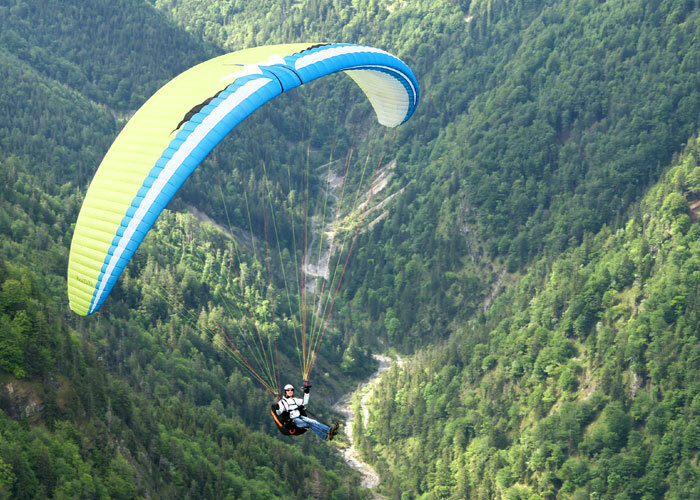 A flick of the hips is sufficient to tighten the turn as the glider responds well. One advantage of sharknose designs is their spin tolerance and the Elan can take a serious pull on a brake before showing any tendency to spin. With this much wind in the mountains I was braced for turbulence but the Elan absorbed the bumps well, inspiring confidence. When asked what it felt like the word “smooth” sprang to mind. But it’s not overly damped: it pitches forward and bites nicely into thermals rather than sitting back, and gives good information about the air, a little like the Sigma 9. In an age when even many EN-B wings sport unsheathed lines, I was surprised to find the main lines are sheathed. “Not every pilot is a fan of unsheathed lines, which knot more easily,” explained Petr. 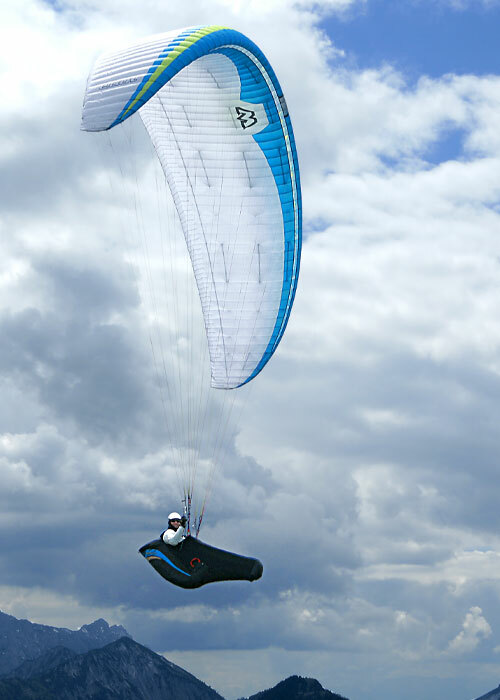 “And the materials we have used on the Elan keep their geometry for a long time.” Although the wing has a three-riser setup, Mac Para have used additional D attachment tabs. These are often used to make the reaction after collapses less dynamic, and they simplify the internal construction of the wing by removing the need for additional load spreading. 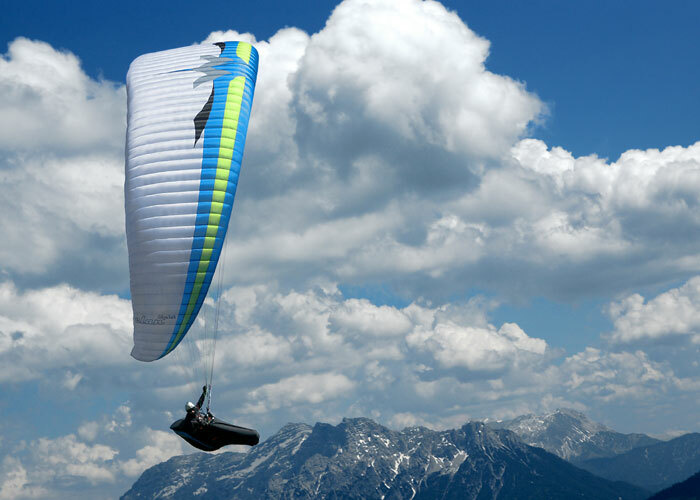 “It keeps the wing light and wrinkle free - wrinkles don’t help increase performance!” Petr said. The risers themselves are nice and thin with a racy feel, with control loops on the C’s for rear- riser control. Everything is nicely finished, as you would expect from an established brand. A few days later the forecast was good, and I hoped for a bigger adventure in the Southern Alps. On our club forum some of the local gurus were planning big triangles, out into the flats before heading to the mountains again to pick up the normal trade route home. Caught up in the buzz I spent the evening looking at their plans and making my own on Tom Payne’s XCPlanner app. Evening dinner plans made the idea of a closed circuit flight even more appealing. So the next day a friend and I headed to a launch along the ridge from Col de Bleine that offers just that bit more distance. In the air the initial climbs were strong, as you would expect. The Elan allowed me to hook into the strong cores with ease and I found it needed very little controlling as I climbed. That comfortable ride means there is much less stress, keeping your mind free for making decisions about the route. This comfort also applied to transitions on bar. The bar pressure is light enough so that you can keep it applied, and more importantly the wing feels solid and retains its ability to absorb the bumps. To be honest I felt little reason to use the C-handles as it just felt so solid. Performance comparisons are notoriously hard but during the first part of the flight I was making the glides with Delta 2s, Sigmas and Aspens and a few EN-D wings and always felt I was up there with them. As the day evolved, I found myself alone heading to the long ridges near St André but with a sky filling with cumulus congestus. To the north I could see rain and snow falling, spoiling the day for the big guns, but with my furthest turnpoint bagged I was heading back home. Initially I was avoiding the darker areas using speedbar and Big Ears to get through the sucky bits. The wing behaves well in this configuration, with the ears not flapping about too much. As the cloud cover spread out and became less active, I dropped onto the ridges to use the dynamic lift. The wing’s damped behaviour and by-now-obvious tuck resistance gave me the confidence to push low through the cols, and its direct handling enabled me to make use of tight areas of lift to continue on. During my time with this wing I had the opportunity to put it through some SIV manoeuvres at Monaco, with a safety boat and the welcome advice of an instructor. I found the comfortable feeling of the wing directly transferred to its behaviour when pulling collapses. Starting with symmetric collapses the wing felt quite slow in its reactions. The larger chord in the centre tends to inflate first, and then the pressure rolls smoothly out to the tips. This means there is a moment when it feels parachutal, but then it nods forward and starts flying again. It’s a similar story with asymmetric collapses: the wing turns but then the collapse rolls out from the centre. It is easy to counter the turn with opposite brake. Burying the brakes for a full stall, there is a small delay before the wing drops back into stall. At this point it is easy to ease up and find the back-fly position, which does not need to be super precise. This flattering behaviour reminded me of its sibling, the Eden 5, and I found I was able to control the position well. As you release you do need to clear the tips carefully by easing up a bit before letting the wing fly. I managed to get cravats on a couple of occasions by releasing too quickly from the back-fly, although there were no huge calamities. The Elan gives a smooth comfortable ride and crisp handling, allowing you to climb efficiently. You can core the strong stuff and leave it to deal with the rough stuff. And as I found out, when the sky’s closing down and the rain starts to fall, this is a wing you’ll still feel confident on to get you out of trouble. That level of comfort makes it a great wing for pilots moving up into the C class of wings, and the handling is engaging enough for experienced pilots looking for a mellower ride. I saw a clip on the BBC’s car review show Top Gear recently where the presenters were racing a performance car around the track. They found it actually went quicker in comfort mode. And with the Elan you might just find the same. 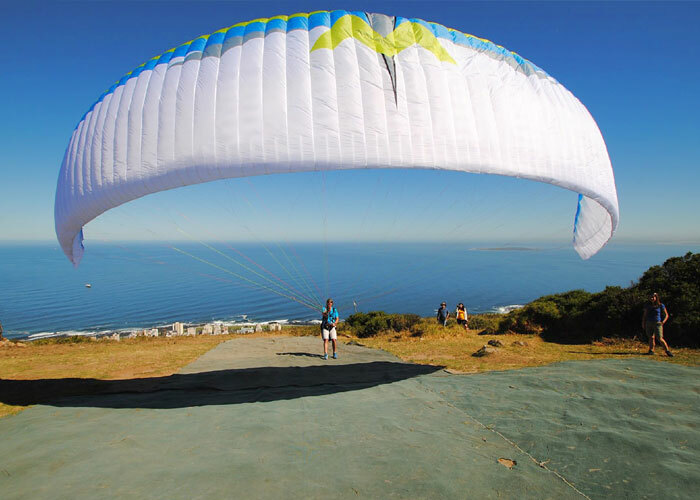 Marcus King flew the Elan 28 with an Advance Impress 3 harness at an all-up weight of 105kg. Direct handling, 6.18 aspect ratio, racy risers with C-handles, good performance level, pitches nicely into the thermals. Comfortable ride in the rough stuff, sheathed lines throughout, 3.5 liner, easy launch, easy handling in full stall. Looking the the new Mac para Elan, showed a more clean and better construction than before. The sewing are very neat and the finish is excellent ! The Elan has a shark nose, with a new and simple interesting construction. The lower lines are sheathed and the upper ones are unsheathed. The thin risers looks very sporty, with the handles on the C risers very well placed ! Launching the Elan is straightforward and simple. The Elan takes it’s pilot quickly in charge for a quick take off. Once in the air i could sense an immediate feel of comfort as the Elan gives that nice confidence inspiring feel ! Flying the Elan at 97 all up on the 26 gives an average brake travel that enable it’s pilot to be in charge whatever the conditions throws at him. The brake pressure is also medium to light and the brake response are quite good, with a description as precise, crispy, direct…Finally…A joy to steer ! I felt that once i encounter a thermal the Elan react as a spring immediately going upward without any delay ! Flying the Elan in turbulence is quite disconcerting for a C.You have to ask your friend later if the conditions were rough…or not…Because under the Elan the pilot is always a VIP on a couch. Saying that doesn’t mean that the Elan is very dampened. It does inform it’s pilot exactly enough about the conditions of the day without being too hot to handle ! The Elan reaction and comfort in turbulence goes more on the Eden 5 side rather than on the Marvel side ! It could clearly be a pilot first C as it’s movement in turbulence are rather soft and the overall reactions are rather smooth and not stiff ! Later i gave the Elan to my friend who flew it at 100 all up just on top. And i took the Delta 2 SM at 92 all up, 3 kg below max. Trim speed is the same for 4 km. The glide also in head wind. The top speed is on the Delta 2 side with +1 km/h only .The glide at full speed is also the same ! Climbing together in weak thermal showed that they are also inseparable. 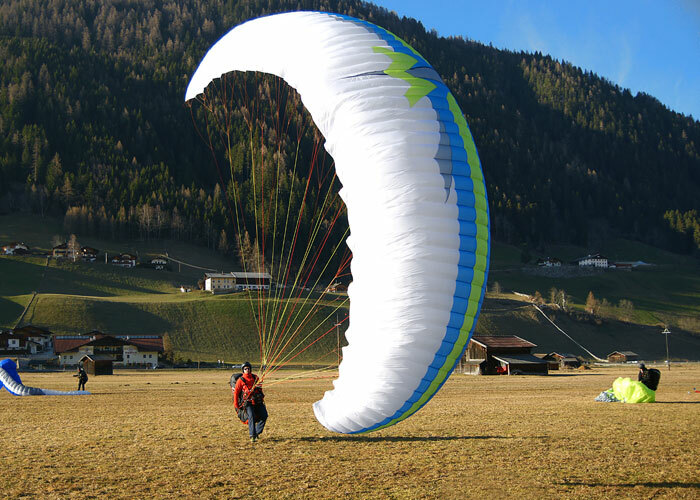 After many glides with my reference top C glider, showed that even with it’s thicker normal lower lines, the Elan finally stands equally performant ! In glide at trim, accelerated and in climb ! The plus comes in favor of the Elan for it’s much more comfort use. I asked the designer for the purpose using the thick sheathed lower lines His explanation is a longer use with the same stable performance for the Elan without pilots fearing for 'an out of trim' situation ! An idea came to my mind...Imagine a lighter ,thin line version !!! Yes they did it ! 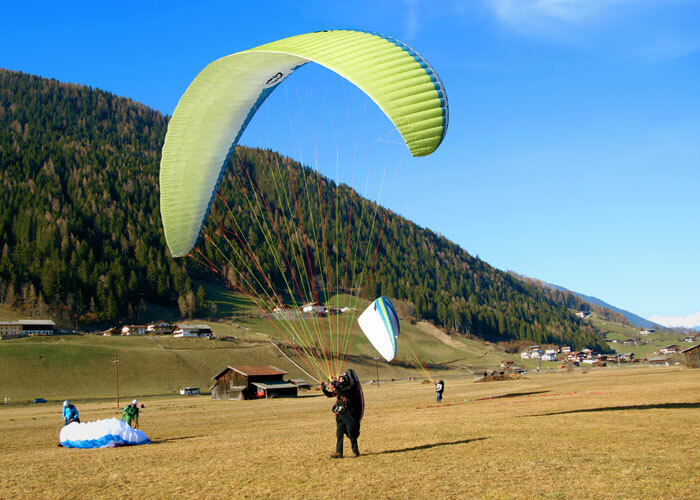 The Elan is manufactured using the paragliding industries well established lightweight material with excellent durability; Skytex 38 Classic, from Porcher Sport (NCV). For the supporting and diagonal ribs we use Skytex 40 Hard with “hard finish” coating E29A. 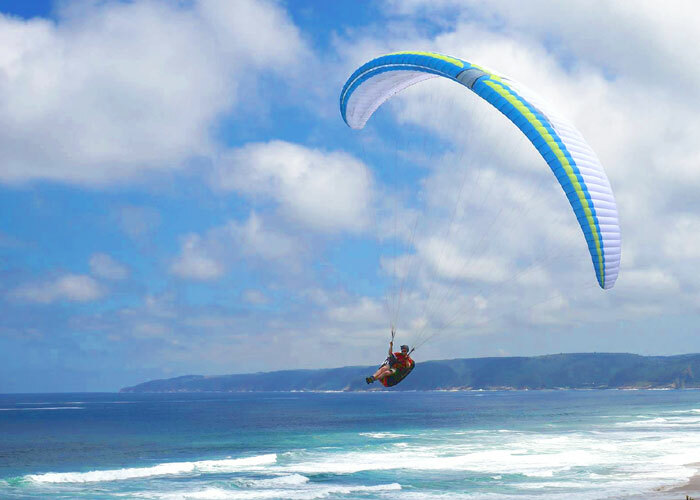 This gives the advantage of a sail that is both lightweight and very durable.